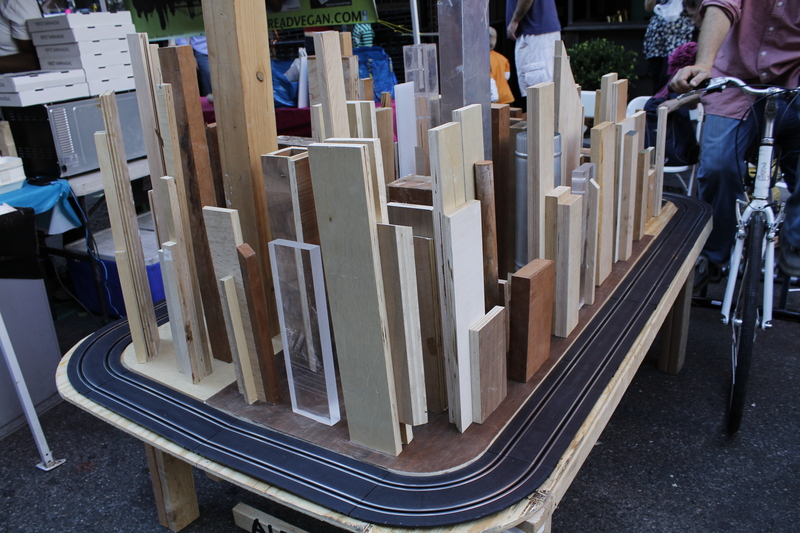 Amid the performers and booths, a mini city made from recycled material arose as the greatest draw at this past weekend’s Fourth Avenue Block FAB! Festival. The architect of this magnificent metropolis, Miggy Buck, could be seen pedaling on a bicycle right next to her creation powering the two toy cars that zip on the track that surround the city. Buck is a sculptor and part time professor at Parsons who also has a custom furniture business. She conceived this piece when she noticed all of the wood scraps that were accumulating in her commercial space/studio in Long Island City. Wanting to recycle the pieces in an innovative way (she teaches a class called Recycle Rethink at Parsons) and inspired by the view of the New York City skyline she sees from her commercial space, she built this sculpture and added the fun interactive element of the bicycle and toy cars. She has lived in the city for 20 years and has been biking around here for just as long. “I’ve seen the evolution of biking in the city over the years. I remember riding around before the city was bike friendly,” Buck laughs. 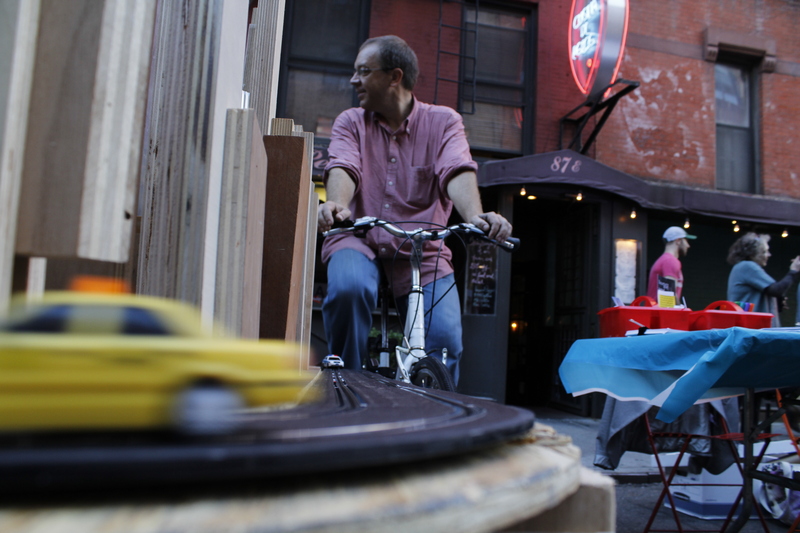 She normally bikes the commute from her apartment on 124th to her studio in Long Island City. The environmental consciousness of biking seemed to be an great addition to the green theme of the sculpture. The toy cars are powered by an alternator that is attached to the bicycle by a belt. When one pedals, they convert the mechanical energy of pedaling into an electrical energy that powers the cars. Buck had set out to not spend any money on the piece, but did end up spending $20 on the alternator, $5 on the belt, and had to purchase the toy cars. Young and old alike congregated around Buck’s city and those who were willing were given the opportunity to hop on the bicycle seat to bring the city to life. Miggy Buck’s miniature New York CIty built completely out of recycled wood scraps from her sculpting and custom furniture practice was one of the main highlights at the FAB! Festival 2013. A toy police car and tax cab rest on the track that surrounds Buck’s miniature city. Next to the sculpture is a bicycle that is hooked up to an alternator which generates the power for the cars to zip around. A young man pedals the bicycle to get the cars moving. Buck set out to not spend a dime in building her sculpture and ended up only paying for the alternator, belt, and toy cars. Buck’s husband, Andreas Thurnheur, takes a turn pedaling the bike. He was responsible for setting up the electronics on the sculpture. Previous post ← Addressing the Inevitable Question: Why Art School?